View: Website (Jessica McLeod's Comics). This morning in bed with tedprior he was telling me about a movie with Chris Pine. I said, yeah, I know who that is. He said, the guy from the Star Trek movie. I said, oh. I guess I didn't know who that is. I started trying to explain who I was thinking of. "He's kind of... clean around the eyes?" For some reason this made Grug hysterical. I tried to explain. I tried to show him what I meant but this just made him laugh harder. My other information ("His name might be Chris? I think he played a love interest once?") did not help. The more I thought about it, I thought he might have blue eyes? And maybe he played a football player in something? yielded no results. THIS IS KILLING ME. I think maybe I didn't make his eyes hopeful enough? I need your help! Who am I thinking of? He has light brown hair and (possibly) blue eyes, but I can definitely say that his eyes are crinkly and hopeful, and he is clean around the eyes. I am saying that he has a lot of face! His eyes are normal sized but his face is big. Maybe his name is Chris? Or he once played a character named Chris? Or maybe not? Please post suggestions (with photos) in the comments! Or is you know who I'm thinking of but can't remember his name, draw him like I did! WE CAN DO THIS! EDIT: It's Chris Klein you guys!!! Grug figured it out in the shower! I was so close! His name even rhymes with Chris Pine! Now do you see what I mean about having hopeful eyes? No, this guy has an even bigger face/eyes ratio. But thanks for the suggestion! I figured it out! See above! He was in a football movie, RUDY. She kept saying 'Clean around the eyes. Clean around the eyes' as if that's a legitimate way that people describe other people. haha, the drawing DOES look like sean astin! hahaha clean around the eyes!!! 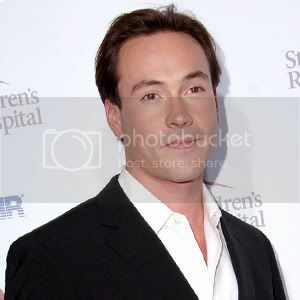 I totally know what you mean :) Chris Klein does always look very wide awake and wholesome. shoot ... happy belated birthday! I have been so busy that I didn't post, but you were in my mind.